The Zoomph mission is to make social content meaningful for brands and its fans. It was founded because of the need for companies to effectively drive social media campaigns without wasting time engaging with the wrong users or running into the culture of spammers. “Analytics are the key to a successful social media strategy,” according to Zoomph. “They can no longer be an afterthought; they must be the driver of social engagement.” As a result, highly targeted and meaningful engagement for top influencers and their content is now available. Founder and CEO, Ali Manouchehri, is said to be a serial + social entrepreneur expanding upon his first business idea at the age of 10. I like hearing that when he is not thinking of the next great idea you can find him in the game room defending his FIFA soccer championship. Ali is also the founder of MetroStar. They developed software for the government. Zoomph found themselves working with Senator Hillary Clinton and the U.S. State Department on Moneyball Diplomacy. She initially used Klout as a filter to find out insights about influencers and content, however, when her team conducted a search for foreign policy and it pulled up Justin Bieber as number one, the former First Lady decided a more robust solution was in order. Zoomph algorithms were used to rank Iranian Presidential candidates and follow the country’s national elections. ZPoints correctly predicted the election outcome. The Arab Spring was also monitored via a dashboard. NASA was another early adopter. ZPoints system is tailored to boost your social influence. ZPoints are granted for both quality and quantity, but more sm weight is given to quality. A post is considered high quality only if it sparks the interest of others in the respective community. They measure that interest in units of attention, such as retweets, or activity on Facebook posts or Instagram updates. The startup business purchased expensive API’s from Facebook and Twitter and wrote the platform code in a 72 hour power session. The ZPoints LeaderBoard is where social media rankings are posted. The leaderboard display is a tool that has multiple uses for teams, corporations and fans. The three Zoomph Social Media Modules are: Analytics, Curation and Visualization Tools. Their Social Hub has real-time polls and customizable social visualization. Widget visualization is available. Curation factors in all the retweet and replies. The Analytics Big Data is delivered in the form of numbers, graphs and social reach items. Event displays such as a Jumbotron, generate a social media feed as a video footer. 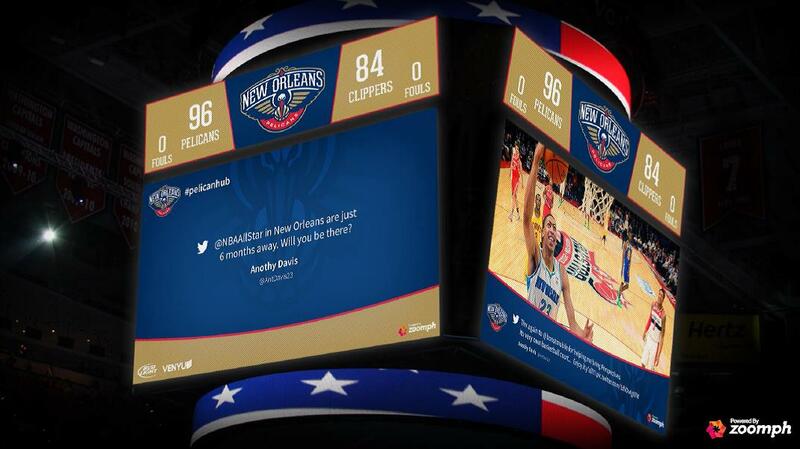 Tweets and Facebook posts fans post during the games can be featured onscreen. Fans love the publicity and winning prizes such as tickets and team merchandise, while sponsors have a new digital opportunity to reach targeted consumers. Comments on a Facebook page can easily be approved or rejected in real-time. Vine and Instagram are currently locked in a tech battle over the six second video. Porter assured me that Zoomph will soon support Instagram video; their engineers are fast at work coding. Meta data are created by the proprietary solution. Trending Words and Trending Posts are an excellent SEO opportunity. Top Influencers can be exported to an Excel spreadsheet and track people that are influential, it is also easy to find out what platform they generate the most engagement from, and you can query Z-Points leaders. Build a community to centralize social media engagements from your fans. Push influential content onto social media hubs optimized for desktops, tablets, and mobile phones. Rank influential social media in real-time from Facebook, Twitter, and Instagram. Use ZPoints™ to maximize your fans’ social media reach, depth, and engagement through Zoomph’s analytics. Bring the most inspiring social conversations to your social hub and pair them with targeted advertisements. Sync these relevant ads with relevant conversations. Zoomph’s Quinton Porter, is their new Account Executive, Sports and Entertainment, and has been at this amazing sports technology job for eight weeks. The company HQ is located near Washington, D.C. however Quinton has a home office in Maine. Porter was a starting quarterback for Boston College, and then played two years in the NFL and five more seasons in the CFL. He earned a MBA, Finance from B.C. – Carroll School of Management. Porter is a new Sports Techie LinkedIn group member. 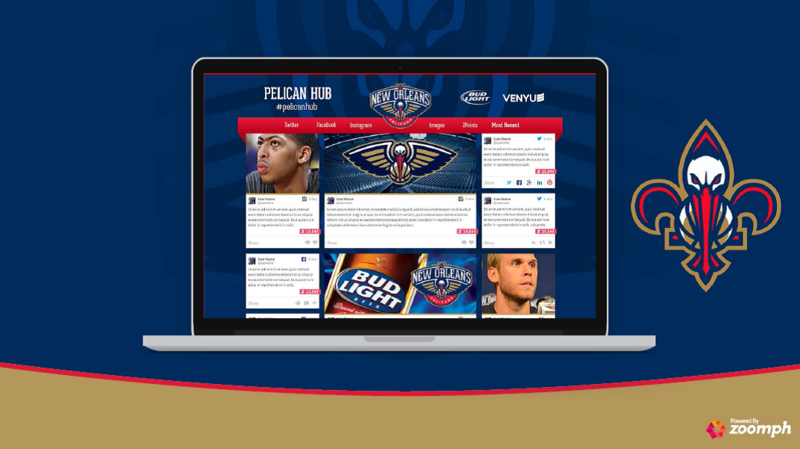 His current pipeline includes the NBA’s New Orleans Pelicans who are interested in the Social Hub. Discussions are underway with the Oklahoma City Thunder. The NFL and NCAA are next and right up his alley. 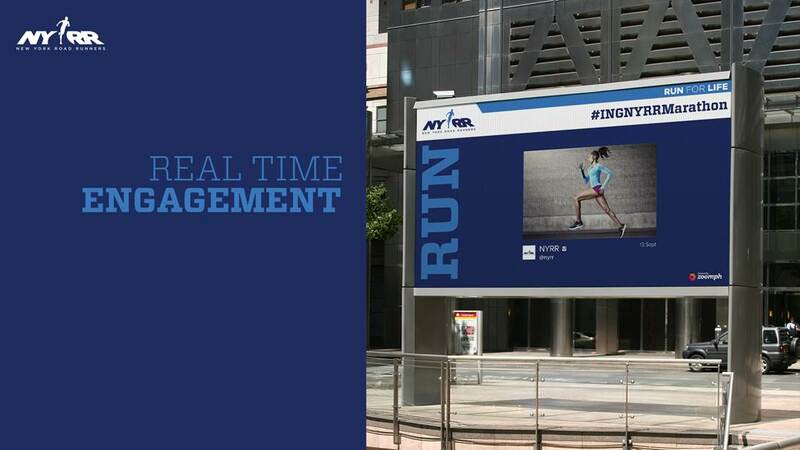 The New York Road Runners Social Hub Video Board, #INGNYRRMarathon, Run For Life, was a huge success. The Michael Waltrip Racing web site significantly increased traffic and fan engagement immediately after implementing their own SocialHub. Porter mentioned that fans like going to the site but are more interested in other people’s posted content rather than Waltrip generated posts. I asked Porter about other platforms and when they will be measured and he said that, “Zoomph will soon begin working with LinkedIn and YouTube within the next several months.” Bloggers are another key opportunity for growth and is a customer base he will continue targeting for online demos. The MIT Sloan Sports Analytics Conference used the ZPoints systems to encourage engagement while the conference was taking place. They did this by highlighting the top influencers in the sports analytics conversation in real time. At the conference on March 1-2, MIT Sloan set up several onscreen Zoomph displays in various panel rooms throughout the building. The top portion of the screen streamed influential Tweets, and Instagram photos. The bottom showed the ZPoints Influencer Leaderboard, a ticker streaming the top 20 influencers during the conversation at any given time. When monitoring the 2013 NFL Combine conversation, ZPoints helped raise the most influential conversations and authors to help filter the noise out of the conversation. When they compared posts from the both the NFL and ESPN’s Sportscenter, it was found that although the NFL had more posts, Sportscenter was sparking more units of attention, therefore becoming more influential at key points in the conversation. The 2013 NCAA Championship final game between Lousiville and Michigan totaled at 1,588,548 ZPoints around the search terms #FinalFour #GoCards #GoBlue #MarchMadness #Louisville & #Michigan on Twitter and Instagram, and Zoomph was able to accurately measure how much influence each author or Tweet or Instagram had out of the 1,588,548 total ZPoints accumulated. This is opposed to other influencer ranking systems that are normalized, and would max out at 100 or 1,000 points. Zoomph software runs & analyzes social content from Facebook, Twitter & Instagram in real time. It maximizes social engagements for brands by tracking trends, the competition, and the market @ large with up-to-the-minute analytics and streams. It provides clients customized, data-rich visual displays and social mashups to present on websites or at events. Its social collaborative modeling capabilities are available for organizations of all sizes. Awards include SIIA Codies Finalist. Learn more at www.Zoomph.com. Sports Techie, I have been a Klout user since I found out about them after interviewing one of their Board members, Kelly Perdew, and realized that collecting data and ranking content, influencers and topics was going to be big business. The ability to assign a figure for each engagement per post is powerful metrics. Whether a Facebook like or the number of Twitter followers is considered, conversations are now being measured by Zoomph based on reach, depth and engagement. Polls to find out if fans like Coke or Pepsi best produced never before seen marketing results and social media insights. The second screen has a new companion, ZPoints by Zoomph. Start a free trial today at their web site and learn how Zoomph is changing the game.